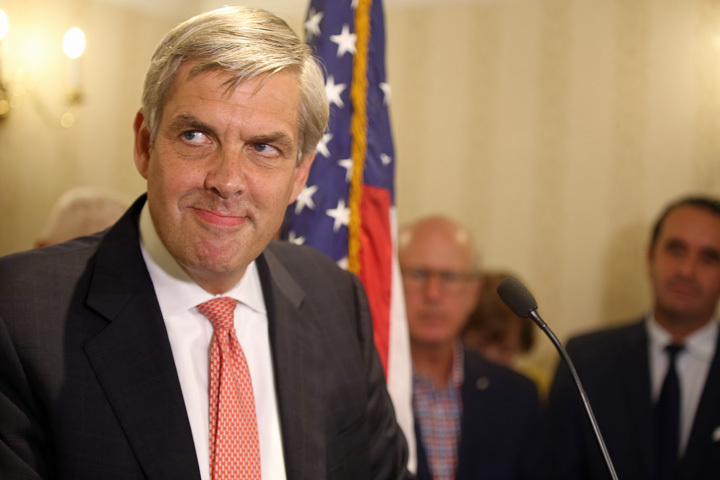 MADISON, Conn. (CN) — No one in the Connecticut Republican Party expected former GE and UBS executive Bob Stefanowski to win Tuesday, but he did. In a five-way primary, with 96 percent of the vote in, Stefanowski had 29.3 percent of the vote, or 41,824 votes; Danbury Mayor Mark Boughton had 30,384 votes, or 21.4 percent; David Stemerman had 26,214 votes or 18.3 percent; Tim Herbst 25,035 votes or 17.6 percent; and Steve Obsitnik 19,080 votes or 13.3 percent. Stemerman and Stefanowski both petitioned their way onto the Republican ballot bypassing the party’s convention process. But Stefanowski took an even less traditional route. Painting himself as an outsider, Stefanowski hadn’t voted in 16 years, was a registered Democrat in 2016 and didn’t vote for Republican President Donald Trump even though he supports him now. Trump offered the primary winner congratulations Wednesday morning via Twitter. Republicans have tried to make this election about Malloy, who is the most unpopular governor in the nation, according to a Morning Consult poll. The two-way Democratic primary for governor was a little more predictable with the endorsed candidate, Ned Lamont, taking the contest with more than 81 percent of the vote. With about 96 percent of precincts reporting Lamont received 68,326 votes to Ganim’s 38,166 votes. Lamont reaped the rewards meanwhile of his decision not to go on the offensive against Ganim, who served seven years in federal prison for public corruption. There wasn’t much excitement for Lamont from voters for his candidacy, but he was able to win the support of the party establishment at the convention forcing Ganim to petition his way onto the ballot. In the Fifth Congressional District, newcomer Jahana Hayes overpowered Mary Glassman to clinch the Democratic nomination and inch one step closer to becoming the first black woman to hold a Connecticut congressional seat. Hayes, the 2016 National Teacher of the Year, won 62.2 percent of the vote to Glassman’s 37.8 percent. Matthew Corey, who only raised $30,000 for his U.S. Senate campaign, bested Apple executive Dominic Rapini by a wide margin. With 96 percent of the precincts reporting, Corey had 99,441 votes to Rapini’s 30,403 votes. It means Corey, who owns a high-rise window cleaning company and McKinnon’s Irish Pub in downtown Hartford, will go on to challenge U.S. Senator Chris Murphy.